This plant is a beautiful winter-blooming shrub with flowers contrasting well with the dark mahogany bark. It is similar to 'Howard McMinn' but more dense and fine textured and is a great choice as a specimen plant or for mass planting in sun or part shade. This manzanita stands out due to it's mass of flowers that bloom so thick they almost hide the foliage! 'White Lanterns' is slow-growing and reached 4'-6' high and spreads out to 8'-10' wide. It is exceptionally disease-resistant. 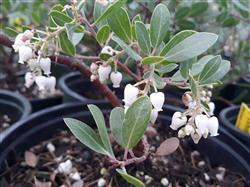 Plant this drought-tolerant Manzanita in full sun.